Ultra Guard is full-width, solid protection for towed vehicles. Made of 3/8" molded reinforced rubber the one piece design is extremely durable and attractive. It protects towed vehicle from damage from flying road debris. The motor home models mount to the bumper or frame of the coach. The truck model attaches to most 2" receiver hitches and is easily removable. Made of 3/8" thick ultra durabel rubber with a nylon cord reinforcement. The one piece design offers an attractive look as well as durable protection from road debris. The material can be cut or notched to accomodate hitches, exhaust pipes, wiring etc.. 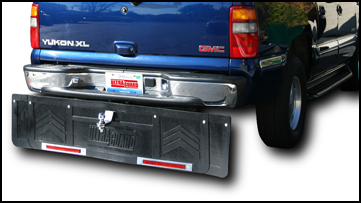 It attaches to the hitch insert of most 2" receiver hitches and slides on and off for easy removal when not towing. A 1"L x 1"W x 70"W Steel Angled Mounting Bar is necessary (sold separately). Made of 3/8" thick ultra durable vulcanized rubber with a nylon cord reinforcement, Ultra Guard is designed to give maximum protection to your towed vehicles. The one piece design offers attractive looks as well as durability. The material can be cut or notched to accommodate hitches, exhaust pipes, wiring/chains,etc. (see mounting instructions). It attaches to the bumper or frame of the coach with a steel angled mounting bar (sold separately).